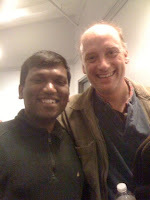 Met this guy in the pic today at a play in NYC, and remembered having seen him in a FOTC video, and that led to the blog post. Leggy Blonde - the video in which I remember seeing this guy. If you are into it - The best part is when the girl says thank you! Jenny - not on the HBO show; one of their best songs! Cheer up Murray - "You look a little sad, your life ain't so bad"
Flight of the Conchords rules! A couple of useful articles - one on WebMD site, one on Mayo Clinic site give me confidence about being able to lose my small yet noticeable pot belly - something I have taken for granted as an impossible task all my life! From a personal perspective, I see I can aim to completely flatten my tummy in 2-3 months time with the kind of exercise and diet control plans I have already taken on. I have been working on a regular and consistent fitness schedule for the last two months - strength training using iPhone apps (for 100pushups, 200situps and 200squats) on Monday, Wednesday and Friday, and running/cardio training on Tuesday, Wednesday and one of the Weekend days. The intensity of the workout determines the amount of calories burnt, and consequently the amount of weight lost. Now that my goal is to increase my running speed and cut down on my 5K time, the intensity of my workouts is increasing. The other big part of this effort is portion control - something I can blame my parents for not teaching me when I was younger ;-) I am taking on making a conscious effort to limit the amount of food I eat, mostly based on a rule of thumb estimate. I really need to hit the treadmill tonight after eating so poorly today and yesterday and the last 25 years. Bye bye little pot belly; you will be missed! Job as Social Networks Manager for President Obama - wouldn't that be cool! On Friday evening, Mashable.com tweeted about an awesome job opportunity - The role of Official Social Networks Manager for the Democratic National Committee and Organizing for America - someone who would manage @BarackObama twitter account, among other things. Check out the full job description on President Obama's website. This is one job description that really inspired me, and made me realize I am not aiming high in my career aspirations so far, and have been getting along with maintaining the status quo so far. After an evening spent grappling with all the reasons why I shouldn't apply ("There will be thousands of applicants for this job", "I don't have all the necessary qualifications", "I am not the right guy for this job", "There is no point in trying", blah blah blah), I convinced myself that it is better to apply and not get it than not apply at all. Prepared a brand new resume and applied for the job by Saturday noon! So far President Obama's team has had amazing success in reaching out to people at the grassroots level through various means, including the Social Media Networks - Facebook, Twitter & MySpace. As far as I know, the social media tools are being used only as a public announcement system, and not for interactivity purposes. Of course, when every entry on President Obama's Facebook page generates feedback in tens of thousands - most of which are likely to be 'noise' - it is really difficult to separate 'signal' and possibly act on it. However, if the team working with the President is capable of putting in place at least some interactivity in a manageable manner on the social media tools, that would totally transform how a current President relates to the general pubic. And would change the face of governing beyond recognition! A month ago, there was an interesting story on Mashable.com about Newark Mayor Cory Booker responding to a tweet, and shoveling for a NJ resident. The President of the US of course cannot possibly be expected to get involved at such intimate level, given the scope and magnitude of his domain & responsibilities. Nevertheless, I wonder how amazing it would be if the Social Media Networks enable some sort of a interactive capability between the President & the Public! OK, I have run/walked two marathons and 4-5 half marathons in the last two+ years. Time to amp up the effort and become more of a runner. I haven't done any work so far focusing on increasing my running speed; being conservative about the effort and content with the "Finishing is more important" mentality. And with that attitude, I have successfully finished races by adopting the running + walking method. Goals accomplished. However, I am finding it no longer fulfilling to go through the same routine. After some consideration about what goal would be realistic as well as inspiring, I have chosen to take on improving my 5K pace. I have signed up for the Coogan’s Salsa, Blues, and Shamrocks 5K race organized by NYRR in Washington Heights on Mar 7th to accomplish this goal. My best time in a 5K so far has been around 32 minutes- that is at a 10.32 min/mile pace. Running a 5K in 25 minutes (around 8 min/mile pace) would be a huge improvement. With emphasis on speed training techniques (interval workouts/track repeats, tempo runs & Hill Training) on a regular basis, I should be able to cut down on my 5K time. Interval workout / Track repeats on Tuesdays: 2 or 3 400m bursts on the running tracks at Lincoln Park; include Hill Training on alternate weeks. Tempo Runs on Thursdays: 1 or 2 mile runs at a "comfortably hard" pace. Long Runs on Saturdays/Sundays: 3 to 5 mile runs at a steady & easy pace. Upper body workouts (100pushups, 200situps & 200squats) + biking on Mondays, Wednesdays & Fridays. Budgeting from 45 minutes to an hour everyday on this effort. Even if I don't meet the goal of running a 5K in 25 min on Mar 7th, this exercise will benefit me in terms of making me familiar with speed training techniques, and prepare myself physically for the required effort in running faster in the future. In the context of signing up for the Legacy Discovery Weekend Course, I got to learn a whole new meaning of "committing to something". As one of the men put it, what was being asked of me was 'to commit to doing the course and say eff it to everything that might come up in the way of me fulfilling on this commitment.' Made me wonder about my commitment to the various commitments I have already taken on either with full awareness or assume with not much examining. There are very few things I am really committed to in my life at this point. While I am involved with / taken on / dabble with many things and projects, there are only a handful I can say I am 'committed to' in the sense mentioned above. As it turned out, my commitment to do the Legacy Discovery Course was put to an immediate test as the dates for the course (Apr 30 - May 2) conflicted with the NJ Marathon (May 2) that I had registered earlier for. Giving some thought about which one I should choose, I realized my commitment to run the marathon wasn't really there, and hence I decided to drop it in favor of the weekend course. A corollary wisdom I subscribe to is 'Take on more commitments to expand one's life'. More often than not, this has turned into taking on too many things without really intending to see them through to completion. I am fortunate to be in a perfect spot in my life at this moment where I have a chance to explore my priorities, examine my various commitments, and give up those that really don't mean much to me. And take on new commitments that would fire me up with excitement and passion! A new job/career, a move to a new place very soon & exploring a whole new world of dating and relationships - it couldn't get any better!